Anti-Static Filter Elements reduce ESD damage in fluids. Available for replacement and custom designed applications, SwiftStaticDischarge™Â filter elements employ media which dissipates triboelectric charges generated via flow of fluids through filter media. This ensures minimal charge across both media and fluid overÂ extended periods to mitigate sparking. Areas of use include power generation applications, plastic injection molding machines, mobile hydraulics, pulp and paper, as well as any other application employing low-conductivity oils. OAKWOOD VILLAGE, OH — Swift Filters, Inc. has announced the availability of anti-static filter elements for both replacement and custom designed applications. SwiftStaticDischarge™ filter elements employ an advanced media technology to dissipate triboelectric charges generated via the flow of fluids through filter media. The unique media insures a very low charge across both media and fluid over long periods of time to mitigate sparking. Electrostatic Discharge (ESD) is a common problem with modern ash-free, zinc-free hydraulic and lubricating oils. These highly-refined oils’ formulations do not contain the heavy metals of previous generation fluids. Oil passing through hydraulic or lubricating system filters can generate static charges leading to high voltage sparks from filter media to the filter’s metal support tube. These sparks can lead to oil degradation and varnish, as well as to component damage and potential explosions. Varnish in oil has a number of well-known consequences, including seized valve spools, overheated solenoids, and filter clogging. SwiftStaticDischarge elements are highly suitable for power generation applications (both for gas turbine lubrication systems and conventional power plant use), plastic injection molding machines, mobile hydraulics, pulp and paper and any other application that employs low-conductivity oils. 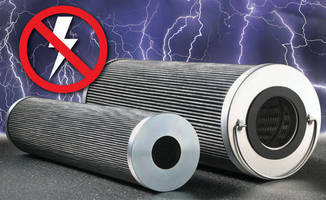 SwiftStaticDischarge™ filter elements can be used as direct replacements for most major OEM filter elements. Swift Filters maintains an extensive interchange database of over 100,000 replacement elements. Additionally, anti-static technology can be employed in custom-designed filter elements produced for original equipment manufacturers. Swift Filters, Inc. designs and manufactures high quality replacement filter elements and custom filter elements for a wide variety of industries. For over 40 years it has been certified as an approved source for the U. S. Department of Defense and private aerospace manufacturers. Swift holds ISO 9001:2008 Design Certification. In 2013, the company was named the winner of its ninth straight Weatherhead 100 Award as one of the fastest growing companies in Northeast Ohio. The company is located at 24040 Forbes, Oakwood Village, OH 44146.